"They’re only crayons. You didn’t fear them in kindergarten, why fear them now?" That's from Hugh MacLeod, also known as "person I idolize who doesn't know he's a mentor to me but keeps sharing great stuff anyway." And this particular nugget is from Chapter 7 of his new book Ignore Everybody, in which he examines creativity and how to live it out. But that's not what I want to talk about. I want to talk about the fact that I think I have finally made a critical step forward in my own fear of crayons, aka my creative energy. 1984: Julia's first word is cheese. Not mama, or da-da, but cheese. 1988-2001: Julia keeps writing. She turns every school assignment into an essay, story, skit, poem, or song. English is her favorite class. And she tells everyone, everywhere, all the time, that she's going to be a writer. 2001: Julia chickens out. Instead of studying creative writing, she studies TV/Radio/Film and Marketing. She never stops to wonder why her screenwriting courses are the happiest hours in her week. 2005: Julia gets a second chance. Her first boss gives her the writing education she always wanted but was too afraid to ask for. With her first job being solely a writing gig, Julia feels her career has been reset, and she digs it. 2008: Julia chickens out again -- that is, until she starts up her blog in earnest and remembers how happy writing makes her. 2009: Julia gets over her fear of failure (for now) and decides to really make a go of it. She embraces the unknown. She commits to writing. She sets goals of getting published. And she puts it all down in a blog post so her readers can hold her to it when if she chickens out again. Of course, I have questions and fears about all this. Is it possible to be a responsible artist -- in essence, forgo the garret and work twice as hard? How will I keep from overbooking myself and not leaving time to write? What if I get tons of rejections? What if my brother is more famous than I am? What if I'm told I'm not good? And the very scariest scenario: What if I learn I don't love this as much as I thought? It's pretty damn frightening, pursuing what you feel called to do ... and assuming all the risk that comes with it. But it's also liberating, because you know you're going to enjoy failing more in this pursuit than you enjoy succeeding in others. 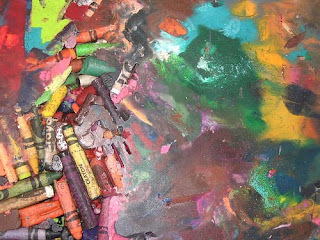 So this writer is getting back to basics -- scrap paper, tumbling-out ideas, and a whole new box of crayons. The Crayola 96-count. With the sharpener. Because my dreams deserve only the best. I,personally, think you will continue to be successful,but there will be some discouraging times and that's when I and lots of your other true blue friends will rise up to lift you up!!! When I was a kid I got into trouble for leaving a crayon in my parents heater, and when they turned it on they smelled something funny and the wax had melted all over the carpet and turned hard! Needless to say, your cousin had hell to pay for that stunt. It took a while, but I no longer fear the crayons.